What was the intended target of the car bombers? What do we know so far about the investigation into the three terror attacks on London and Glasgow over the weekend? Five people have been arrested following Saturday's attack on Glasgow's Airport and after two car bombs were found in London's West End. Two people were held at the airport, one of whom is critically ill in hospital. Two further people were arrested in the early hours of Sunday on the M6 and a fifth person has been held in Liverpool. The three detained in England have been taken to Paddington Green police station in London. Searches have been taking place of addresses in Liverpool, Staffordshire, and near Glasgow. BBC correspondent Daniel Sandford said at least one terror suspect was still on the run on Sunday night. Prime Minister Gordon Brown has told the BBC it is clear "we are dealing in general terms with people who are associated with al-Qaeda." Deputy Assistant Commissioner Peter Clarke, the UK's counter terrorism co-ordinator, has travelled to Scotland to co-ordinate the investigation. What do we know about the two bombs found in cars in central London? We know both bombs were both found in Mercedes cars - one was metallic green, the other a blue 280E model. We also know the first vehicle, which had been parked near a busy nightclub in Haymarket, contained gas cylinders, 60 litres of petrol and nails. An ambulance crew alerted police when they saw vapour coming out of the car. The second device also included petrol, cylinders and nails. It was discovered in a vehicle in a Park Lane car compound after it had been towed away for being illegally parked near to Trafalgar Square, just a few minutes' walk away from the first vehicle. The police say the devices were "viable" and "clearly linked". And what do we know about the incident in Glasgow? A car crashed into one of Glasgow Airport's terminal buildings at 1515 BST on Saturday. Eyewitnesses described a Jeep Cherokee being driven at speed and on fire. Strathclyde Police have confirmed the attack is being linked to the car bombs in London's West End. Do we know anything about who was behind the London incidents? The fact that two vehicles were identified in London is in itself highly significant as it points towards group organisation and planning, rather than the actions of a lone figure. Specialist officers from the Metropolitan Police's Counter Terrorism Command are poring over thousands of hours of CCTV footage so they can try to identify the drivers or occupants - and their routes in and out of central London. One unconfirmed report in the US media, citing American officials, claims the police have a "crystal clear" picture of a suspect. Have the police said anything more about the characteristics of the London car bombs? Suicide car bombings may sound the most far fetched, but the tactic has been regularly used in Iraq by insurgents sympathetic to al-Qaeda's ideology. Given that the major threat in the UK is posed by extremists pursuing the same ideological aims, suicide car bombings cannot be entirely ruled out. What do the intelligence agencies know? The intelligence agencies will be looking at all possibilities, and although they are keeping an open mind, they are leaning towards an international element to this because of a number of circumstances. MI5's outgoing chief said late last year said the security service was looking at 1,600 individuals in 200 groupings involved in 30 distinct plots. There is no suggestion that the numbers have diminished since that unprecedented public statement. The government operates an official public system for the level of threat posed to the UK. The level was raised to "critical" as of Saturday evening for the first time since 14 August 2006. This is the highest threat level and its purpose is to guide the police and other agencies in their security and counter-terrorism planning. Can the London bombs be linked to other foiled or successful attacks? The police have not speculated. But Mr Clarke said on Friday he recognised that facets of these attempted bombings "resonate" with previous plots - in particular the gas cylinders and the location. 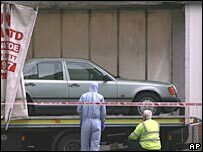 A London man called Dhiren Barot, jailed for life in 2006, had meticulously planned attacks using an explosives-packed limousine. He drew up a complex "business plan" of how he could hit targets in the UK using propane gas canisters. The plans were found in Pakistan after Barot circulated them to al-Qaeda figures, seeking funding and support. His seven British accomplices were jailed recently - one of whom had been tasked with sourcing the cylinders. However, Scotland Yard is dismissing reports in the US media of a direct link to Dhiren Barot's conspiracy. Is there any significance in the locations? There may be some significance in one of the car bombs having been parked in London's club land, one of them being very close to the Tiger Tiger venue. Islamist extremist literature, particularly on the internet or in radical preaching, is known to have singled out clubs as examples of the immoral hypocrisy of countries like the UK. Five men jailed earlier this year for their part in a massive fertiliser bomb plot had considered targeting a central London club. Some of the men, led by Omar Khyam of Crawley, debated attacking the Ministry of Sound club. Islamist extremists are not the first to attack clubs. Irish republican bombers in the 1970s targeted clubs and bars frequented by soldiers.